As usual, the world’s most powerful nation exaggerates: First, gas was ultra-cheap at $1 a gallon. Now it’s super-expensive at $4.40 a gallon. When one considers that the average American drives 20,000 miles a year and their beloved monstrous SUVs only get about 7.4 MPG, it was obvious something had to be done. And it came to pass that Rocky Twyman, leader of a Washington church choir, stood in front of a filing station and prayed. "God is the only one we can turn to at this point," Twyman prayed at the pump. "Our leaders don't seem to be able to do anything about it. The prices keep soaring and soaring." Anyone who wished to follow his example-–and this was broadcast far and wide on American television--was advised to keep it simple: "God, deliver us from these high gas prices," Twyman said. "That's all they have to say." But Twyman quickly added a couple of secular tips: "People have to walk more, leave their cars at home, and carpool," he said. Gone were the believers. Trying to get around without a car isn’t practical in a country where there aren’t even any sidewalks in the suburbs. In rural areas, there are only long-distance buses, and even in a big city like Los Angeles there’s no subway. The fact is, many commuters now avoid getting stuck in traffic jams by hitchhiking on those freeway lanes designated for two or more passengers per vehicle only. Just a couple of months ago, congress set new fuel efficiency standards for the auto industry by mandating a fleet average of 35 MPG by the year 2020. Meanwhile, a popular new sport has developed: “hypermiling.” Brake as little as possible, shift into neutral as often as possible, draft the vehicle ahead of you, turn off your built-in refrigerators and rooftop floodlights-–the internet is brimming with such tips to save fuel. All these things so people won’t have to sell their over-sized Ford Ranger Pick-ups (there’s no market for them now, anyway) and meanwhile, sales of hybrid models have tripled within a year. Dealers react to the crisis with typical American marketing gimmicks: in Virginia, a supermarket promised free gasoline vouchers at their grand opening. Expectant customers had already created a tent city in front of the store the night before the event. 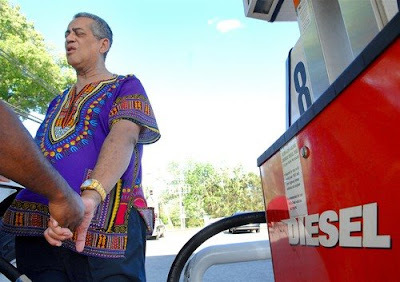 In Nevada, a bordello enticed customers with promises of discount gasoline, although no customers would admit to taking advantage of the offer. The fast-food chain “Five Guys” offered to give customers 6 gallons of free gasoline for every 100 hamburgers they ate. If they haven’t exploded in the meantime, they’re probably still driving today. But maybe Rocky Twyman’s prayers did manage to help. In June, Americans drove 12.2 billion miles less than the same period the previous year, a reduction of about 4.7 percent. Just like that, the USA was able to lower its crude oil consumption over the first six months of the year by 800,000 barrels a day as compared to 2007. The conflict in South Ossetia may be in standoff mode, but it certainly isn't over. It has been said repeatedly in reports that the conflict is deep rooted and complex. Master Plan or Screw Up? The American-armed and trained Georgian army swarmed into South Ossetia last Thursday, killing an estimated 2,000 civilians, sending 40,000 South Ossetians fleeing over the Russian border, and destroying much of the capital, Tskhinvali. The attack was unprovoked and took place a full 24 hours before even ONE Russian soldier set foot in South Ossetia. Nevertheless, the vast majority of Americans still believe that the Russian army invaded Georgian territory first. The BBC, AP, NPR, the New York Times and the rest of the establishment media have consistently and deliberately misled their readers into believing that the violence in South Ossetia was initiated by the Kremlin. Let's be clear, it wasn't. In truth, there is NO dispute about the facts except among the people who rely the western press for their information. Despite its steady loss of credibility, the corporate media continues to operate as the propaganda-arm of the Pentagon. The authorities of Georgia once again organized a bloody war, feeling the support of some western countries and of regional and international organizations. It will take decades to cleanse the shame poured by the current holders of the power over the Georgian people. 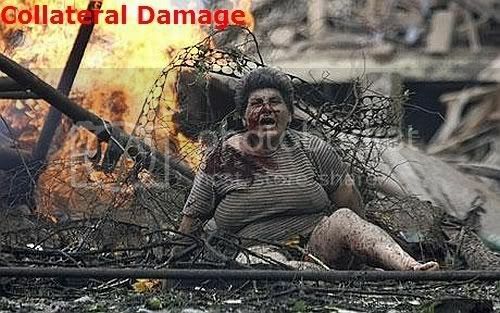 The entire responsibility for this fratricidal war, for thousands of children, women and elderly dead people, for the inhabitants of South Ossetia and of Georgia falls exclusively on the current President, on the Parliament and on the Government of Georgia. The irresponsibility and the adventurism of the Saakashvili regime have no limits. The President of Georgia and his team, undoubtedly, are criminals and must be held responsible. The Art Of Institutional Slander - Are You A 'Person Of Interest'? "...the 'person of interest' is someone against whom there is no real evidence but someone who can be, at least for a time, used, vilified, scapegoated. It's time our law enforcement politicians learn to say 'No comment' and for them to educate the public that very often, especially at the beginning of a case, police have no idea who the perpetrator was, or at least no real evidence." Millions of words have been written and spoken about the politicization of the Department of Justice before, during and after the departure of Alberto Gonzales. But the silence on two of the DOJ’s most toxic practices has been deafening. One is publicly labeling someone “a person of interest.” The other is wildly exaggerating the seriousness of the charges against a person. Both have been widely and indiscriminately used over the past decade. Both have destroyed people’s lives. Both have contributed to the environment of fear that followed 9/11. Both have been unashamedly exploited for career advancement by prosecutors, and for political gain by zealously loyal Bushies. And neither has received any serious attention from the media or from the current presidential candidates. But a new occupant of the Oval Office could and should end these dreadful practices with the stroke of a pen. What exactly is a “person of interest?” The answer is that nobody knows. And nobody knows because the term has no basis in law. It first rose to prominence when the DOJ applied it to Richard Jewel, the hapless security guard who alerted authorities to the presence of a suspicious package at Centennial Olympic Park in Atlanta. A bomb exploded there shortly afterwards, killing a bystander and causing a fatal heart attack to a foreign journalist. It wasn’t long before the Feds’ attention shifted to the guy who should have been celebrated as a hero. Jewel was “not accused” of planting a bomb or of anything else. The Clinton Justice Department told the media he was neither a “target” nor a “suspect” – terms customarily used by law enforcement. But he was effectively both. He was relentlessly harassed by the media, which painted him as a gung-ho cop wannabee. And his life was forever damaged, notwithstanding a belated apology from then Attorney General Janet Reno (the FBI never apologized). Then came Steven Hatfill, the “person of interest” in the deadly 2001 anthrax mailings. In 2002, he was labeled a “person of interest” by then- Attorney General John Ashcroft. Tagged by the FBI, but neither accused nor charged, the Feds hounded this government scientist 24/7 for years. He lost his job and his reputation and became obviously unemployable. Hatfill sued the DOJ. This summer, he agreed to take $5.82 million and an apology from the government to settle his claim that the DOJ and the FBI invaded his privacy and ruined his career. Since Jewel and Hatfill, the “person of interest” moniker has metastasized to local and state law enforcement authorities that have used it hundreds of times. And since most ordinary folks lack the resources to fight back against injustice by innuendo, they have no option other than to let the authorities wreck their lives. Under the DOJ’s own guidelines, prosecutors are allowed to publicly identify a person only they are seeking an interview for a criminal investigation. These guidelines prohibit any other disclosure of a person’s name until formal charges have been brought. Honored in the breach, as they say. The National Association of Police Chiefs got it absolutely right when they called “person of interest” a "euphemism for a suspect." WASHINGTON (AFP)- US researchers have come up with a pill that promises to give a typical junk-food snacking couch potato the silhouette of an athlete and the endurance of a marathon runner. The drug, which mimics the effects to the body of exercise, works on mice at least, according to scientists at the Salk Institute for Biological Studies in California. Created only for research and not available commercially, the drug works on a mouse's genetic switch called PPAR delta. Scientists understood that in genetically-engineered mice, when the switch was permanently activated, it left the mice with a huge level of endurance, turning them into "indefatigable marathon runners." "We wanted to know whether a drug specific for PPAR delta would have the same beneficial effects," said research team leader Ronald Evans of the Salk Institute's Gene Expression Laboratory. The first tests failed, however: the oral drug appeared to activate the gene, but the mice did not do better as exercisers unless they were forced to exercise at high levels. Only then was their endurance heightened. How much of the $10 billion in aid Bush and Cheney gave to Pakistani dictator Pervez Musharraf after September 11 ended up being used to kill US, NATO and Afghan troops in Afghanistan? NYT reports that US intelligence intercepted communications between elements of the Inter-Services Intelligence, Pakistan's military intelligence division, indicating that they gave support to the Haqqani group of Pushtun guerrillas in bombing the Indian embassy in Kabul. The Pakistani military has tight command and control. ISI's collaboration with the neo-Taliban and other guerrilla groups could not occur without the knowledge and acquiescence of Pakistani president Pervez Musharraf, who was chief of staff until last fall. That is, Cheney, Bush and McCain have backed to the hilt a military dictator who has continued the old 1980s and 1990s policy of supporting Pushtun guerrillas as a way of a) dominating Afghanistan and b) training other guerrillas to hit Kashmir. Musharraf's 'successful state' involved dismissing the Supreme Court, provoking massive and repeated demonstrations, violating the constitution, interfering with free and fair elections, and presiding over a virtual national meltdown on the assassination of Benazir Bhutto late last December. McCain appears to value nothing beyond sheer military might-- even if it has shady contacts to al-Qaeda!